Things like wall colors and candles mattered to me more than I had guessed, and it felt freeing to admit it. I wanted to sink into the unpredictability of a cross-cultural life, yes, but I also wanted a bona fide home. This was a season of refinement, of acknowledging there were multiple sides to me that were equally true. I was infected with an incurable sense of wanderlust, but I was also a homebody. When I read those words from Tsh, I exhaled, relishing the sweet acknowledgment that there was someone else out there in the world that understands that weird dichotomy of who I am. 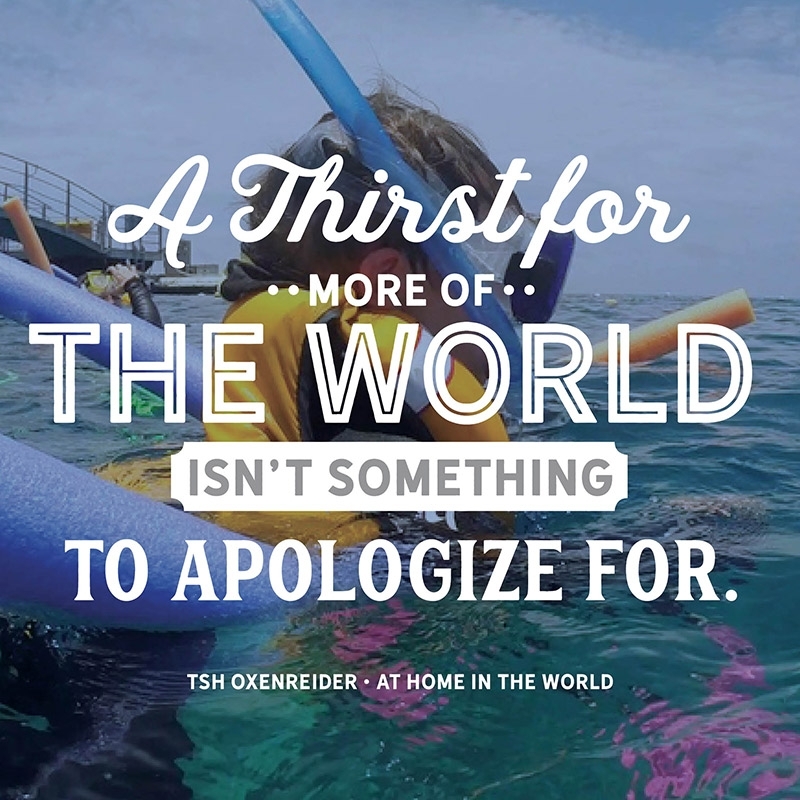 I dived into Tsh’s new book, At Home in the World, Reflections on Belonging While Wandering the Globe, with an enthusiasm I hadn’t experienced in a long while in my reading adventures- and I wasn’t disappointed. Tsh Oxenreider is a writer you may recognize from her blog, The Art of Simple. Her family (she has three young kids) went on a yearlong tour around the world a couple of years ago. I have always enjoyed following along with her travels through her posts on social media but I was anxious to find out more. I had questions. I wanted to know how she did it! It seemed we had a lot in common, Tsh and I. There’s a shared love for adventure and new experiences, we both lived in the beautiful Pacific Northwest (until recently for her) and we both seem to have an affinity for simple living. One more thing: we’ve both homeschooled our kids off and on. There was one BIG difference, though. She’s done something I’ve only dreamed about. @@She traveled over 4 continents with her family of five over the course of a year@@ and wrote a book about it. Her worldwide travels with her young family didn’t happen because she was outrageously wealthy (which I wouldn’t relate to). No, she made it happen because she and her husband (who both had jobs they could work at remotely) saved, made sacrifices, sold their home, and engaged in some careful and creative planning. I loved At Home in the World because it’s a combination of wonderful stories about her travels (told with humor and enough details that I felt like I was living vicariously through the pages), practical applications that I could carry over to my own travel plans, and nuggets of wisdom on life, contentment and the meaning of home. Tsh doesn’t sugar coat her experiences, which I appreciate. She tells it like it is. There’s also a sense of gratitude and contentment in the way this book is written, an acknowledgment that there’s a blessing to ordinariness, which can be found no matter where you are…if you are, at home in the world. If you’re looking for a great book to relax with, something fun to enjoy this summer, I recommend, At Home in the World. You can get it on Amazon or wherever books are sold, right now. I was provided with an advance reader copy of this book but all opinions are my own. Now, because I love you, and because I haven’t done a giveaway in a long while, I want to offer one of you, your own paperback copy of, At Home in the World. I’ll leave the contest open for one week and announce the winner next Wednesday, May 17, 2017.